Platinum has played a very important role in shaping the history of mankind particularly the world of science and technology. Usage of platinum dates back from the ancient civilization of Egypt and the Roman Empire. However due to the rarity and isolation of the metal unlike that of gold and silver, it can only be found in the history of the western civilization, and in modern times can only be mined either in South Africa or the Ural mountains of Russia. So rare that it is 30 times rare than gold and so scarce that if the entire platinum in the world is gathered inside an Olympic-size swimming pool, it would barely reach an ankle. Asia has no particular episode in its history where it was indicated that the metal was used except during the early part of the 20th century or before World War II broke out. In some occasion during the occupation of Spain, some gold coins intended for monetary circulation in the Philippines. Spanish counterfeiters used platinum to counterfeit gold coins because of its high density and its closeness of weight with gold. Platinum was never considered by the Spaniards as valuable metal because of its high melting point and high-resistant to heat which made it an unqualified candidate for minting coins. In the Philippines, platinum has never become a subject nor has never been identified as part of any period of its history except for several rumors that the metal was secretly smuggled to the Philippines by the Japanese Imperial forces during World War II. Nonetheless, treasure hunters have pursued this rare metal with no particular evidence of success except for more rumors and tall tales. Recently, an amulet or "anting-anting" entirely different from any other amulet surfaced and was accidentally discovered. Rarely that a white anting-anting has ever been produced nor have been encountered at all. So different that it was initially thought as made of stainless steel. Its size is exceptional with a diameter of 55 mm and about a millimeter thick. First, I was hesitant to write an article about it and introduce this to the public since I was not really sure what it is. After making some test and analysis, the amulet was found to be made of platinum. The discovery of this metal as being thought to have been absent in the history of the Philippines has significantly altered what we know about our past, particularly the period of "The Revolution" between the end of the 19th century and the middle of the 20th century. According to our history, anting-anting or amulets were worn by the Katipuneros during the revolution to give them strength and protect them from the bullets of the Spaniards. Under equipped and without armors nor shield to repel projectiles, these amulets served (as they believed)as the source of their unusual power and strength. 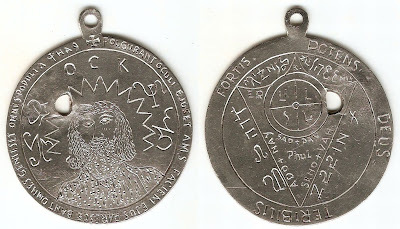 The inscription written on the amulet is Latin though some of the words seems to be borrowed Latin or pidgin. The formation and arrangement of symbols are masonic while in some part of the amulet coded messages that could represent direction or maps can be seen. Whatever is written on this amulet is another mystery to solve while its discovery will now definitely create a major impact in the rich history of the Filipino people. Instead of answering a puzzle, this piece of artifact now baffles the world of antiquities and even numismatic. Where did this piece come from? Who made it? Who wore it? And more questions, which I myself still has no answer. anyone knows buying Philippine amulet coin? "Un Peso Sagrado Verdadero" or "San Jose"
i have one.. pls reach me at 0933-3234411 thanks!